The world knows Nostradamus as the man who predicted many major world events. Well 5thRounders, Ngo-stradamus will look to do the same thing, but in the context of the MMA world. 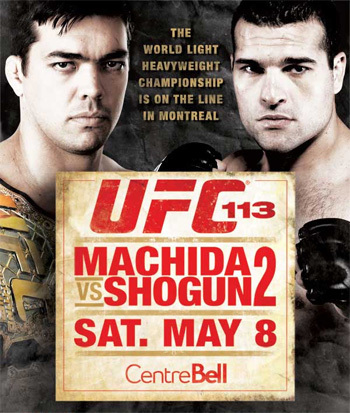 Let’s see if the all-mighty one can make another lucrative set of predictions for Saturday’s “UFC 113: Machida vs. Shogun II” event. Cote hasn’t set foot inside an Octagon since tearing his knee in the 3rdround against champion Anderson Silva at UFC 90 back in October 2008. The Canadian had a couple minor setbacks in his recovery, however the middleweight is anxious to prove that he’s back and better than ever. Most fans wouldn’t have guessed it, but this will be Belcher’s 11th consecutive fight for the UFC – a feat not many can stake claim to. He owns a respectable 15-6 mark overall and was last seen handing Wilson Gouveia a 1stRound TKO loss at UFC 107. The Gambling Gods believe these heavyweights are evenly matched, so you can flip a coin as to who you would like to lay your money on. However, it’s likely Kimbo’s ground game hasn’t improved much since posting a unanimous decision victory over Houston Alexander in December. At the same time, Mitrione’s skills aren’t very well known either, as he owns a perfect 1-0 record. Although his hands aren’t as lethal as the street fighter’s, he does have the size to press Kimbo against the cage and drag him to the canvas. The question will be whether “Meathead” intends to stick to the script or live up to his nickname and risk getting put to sleep by Kimbo. Stout is one of the division’s more talent fighters, however has been unable to find consistency in his game. He will be riding a two-fight winning streak into the Bell Centre, however the Canadian lost his two bouts before that, only to win the pair of contests prior to those losses. Although he owns a 15-1-1 record, it’s been over four years since Stout has put three straight wins together. Stephens may not be the most technical 155-pounder in the world, but he certainly is one of the most relentless. Twelve of his 15 wins have come by some form of knockout, so it’s clear how the slugger would prefer for this fight to go down. This pivotal welterweight matchup has provided some of the most entertaining pre-fight trash talk MMA has heard in quite some time. For all of his humorous verbal jabs, Daley packs quite the punch, so it might not be the best night for Kos to test his improved standup game. Koscheck is by far the superior wrestler and it would prove wise for him to stick with that gameplan. Although he’s currently a heavy favorite to walk away victorious, the American Kickboxing Academy trained fighter was over a 3-to-1 favorite when the line first opened. It appears Shogun isn’t catching anyone by surprise this time around. The challenger was a 3.5-to-1 underdog when the light heavyweights met at UFC 104, but is less than half of that entering Saturday’s rematch. Much has been made of the Oceans 11-esque robbery Machida got away with last October, however both have promised to leave no doubt as to who the world’s best 205-pounder is when it’s all said and done. Can Shogun once again crack the code and locate MMA’s most elusive striker? Will Machida be able to dodge, duck, dip, dive and dodge (and punish) his way to a perfect 17-0 record?